Whether you are riding into town in something lowered, lifted, chromed out or rigged up for Carlisle Events&apos; Carlisle Truck Nationals, we have the perfect weekend planned for you! Carlisle Truck Nationals is one of the largest and most action-packed truck events in the world. This is a family-friendly event with a rock climbing wall, mechanical bull, zip line and much more. The Carlisle Truck Nationals&apos; show field hosts around 2,000 trucks, Jeeps and SUVs. Attendees can take in some grandstand action with burnout contests, low truck limbo, high truck contest, frame dragging, and a beauty pageant competition. 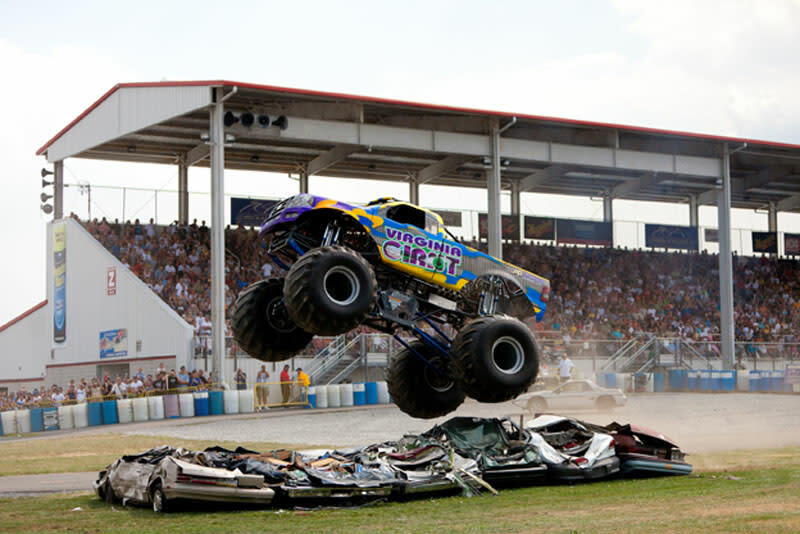 A car-crushing monster truck show visits Carlisle again this year as well as the kid&apos;s activity area, Phantom Fun Zone, a scavenger hunt and more. Daily admission is just $15, Friday and Saturday with a Sunday special of $7. Or pick up an event pass for an incredible value of just $25. Kids 12 and under have free admission, although there is a fee for rides and games. The Truck Show is very family-friendly, so if you&apos;re bringing the whole crew schedule time for more family fun in Cumberland Valley. View specific trip ideas for families here or check out a few of our recommendations below. Carlisle Sports Emporium- Get behind the wheel yourself and race at one or all three go kart courses. Competitors in the family will enjoy attractions like mini golf, rock climbing, arcade games, and laser tag. Army Heritage Trail- Walk the outdoor museum and reflect on the storied past of the United States military. Located at the U.S. Army Heritage & Education Center in Carlisle, this one-mile course showcases each era of the U.S. Army, with full-size exhibits and artifacts. Hersheypark - Just 45 minutes away from the Carlisle Fairgrounds is the internationally known "Happiest Place on Earth." Stay another day and visit the Hershey Amusement Park, Chocolate World, and Zoo America. Whether you&apos;re in to hitting the trails or uncovering history, the Valley&apos;s attractions and sites allow for more fun during your car show weekend. Get outdoors by hiking our portion of the famous Appalachian Trail, or at one of three state parks, Kings Gap Environmental Education Center, Colonel Denning, and Pine Grove Furnace. If you&apos;re more of a biker, view our scenic options and special bike routes. Finally, outdoor enthusiasts can cool off by swimming or boating on the water. History buffs can step back in time and follow the traces of the Revolutionary and Civil War throughout the Cumberland Valley. Visit the statue of iconic Revolution War figure, Molly Pitcher in downtown Carlisle. Military history buffs will also enjoy the U.S. Army Heritage & Education Center and the Carlisle Barracks, both just minutes away from the Carlisle Fairgrounds. The Cumberland County Historical Society in downtown Carlisle provides great history of the Cumberland Valley. Looking for a nearby restaurant in Carlisle, a place to take the kids, or a great spot with outdoor seating? Browse our dining options below. With all these great things to see and do at Carlisle Truck Nationals and the surrounding Cumberland Valley, you&apos;ll want to stay the whole weekend. Compare rates, find car-friendly amenities and book online at the Official Lodging for Carlisle Events. Carlisle Pennsylvania, and the surrounding Cumberland Valley, are easily accessible with connections via Interstate-81, I-76, I-83 and US 11/15. Our convenient location, just two hours west of Philadelphia and two hours north of Baltimore and Washington D.C., makes getting here a breeze. We are also surrounded by popular destinations like Hershey, Harrisburg, Lancaster, York and Gettysburg and 30 minutes from the Harrisburg International Airport and Amtrak Station.